Google has been hard at work this past summer teaming up with schema.org to develop a new speakable markup that’s aimed at helping users find the most relevant search-related content on the Internet. This feature works in tandem with Google Assistant and all other Google Home devices to scour the depths of the Internet for what’s being referred to as “speakable” news articles and content. What this means is that news publishers now have the ability to enhance their articles by formatting specific portions so that they stand out from the rest of the piece. 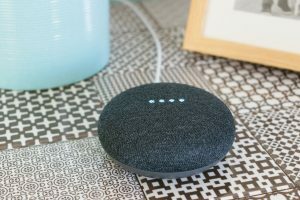 When users make certain verbal queries to their Google Home devices, these portions of the content are recognized as “readable” and can literally be read aloud to the user. Keep reading to learn more about this fascinating and innovative technological development and how it can help enhance your user experience and traffic to your news site. Whenever users make specific search queries, especially voice-operated ones, they’re usually looking for quick and easy-to-comprehend answers or solutions. For instance, if someone uses the voice command on their Google Assistant device, they most likely just want the highlights regarding the most recent news events that interest them. Google’s new speakable markup takes things a step further by providing the top three performing and most relevant links in relation to the search query. It then reads the most relevant portions that pertain to the user’s question out loud and offers to send the links to the top three articles to the user’s mobile device. This gives the user the option of engaging in further reading on the subject later on at their convenience. Currently, the speakable markup is still in the BETA phase and is only being implemented throughout the United States for devices that are set up in English. However, Google has announced that it has major plans to further expand this feature to multiple other languages and countries around the world provided that a sufficient number of news outlets show interest in it. Considering the fact that voice-activated searches are the wave of the future and a substantial percentage of users engage in it on a daily basis, it’s predicted that these changes will be put into action sometime in 2019 if they’re not already in the works. Eligibility to be included in this application depends on the official status of the news web site in question. As of now, the web site must be classified specifically as an English-speaking news site. Once the BETA testing has determined that enough users are interested in having this feature permanently available to them, Google will expand it to include more widespread content and a variety of languages. Another important factor is making sure that the content is easy to understand when read aloud by a digital device. Keep in mind that while these applications are designed to mimic natural speaking patterns of humans, if the content isn’t structured or formatted a certain way, it might be difficult for the device to distinguish one sentence or word from another. When that happens, the reading sounds like a jumbled mess and is very difficult to understand. Selecting brief, yet informative portions of your content is the best way to go because once the user’s question is sufficiently answered through the short interaction with their device, they can then click on the link that was sent to them to read the rest of the article. The point of the speakable markup is to spike the user’s interest in the topic and keep them engaged enough to willingly visit your web site. Additionally, by only highlighting the key points in your content, you can guarantee that users are only presented with the information they’re looking for in a clear and concise manner. Of course, the content itself should also be clear, concise, and to the point. Don’t overdo it by including long and weighty headlines or paragraphs. Make sure to always include as many relevant keywords and phrases as possible throughout each piece. When it comes to written versus verbal searches though, it’s important to keep in mind that you now have to match the most common speaking patterns for any given phrase. After all, the way people speak is typically far more colloquial than the way they type in a search term. If you want your article to be found by Google voice command searches, then you need to be able to foresee and match the average user’s speaking patterns. The structure of the content is just as important as the content itself. In order to be easily recognized and read aloud by Google Home devices, your content should be broken down into short, succinct sentences that encompass all of the information you want to communicate. Try not to barrage the reader with too much information in one sentence. Instead, spread it out throughout the content as much as possible. Not only does this make readability easier for Google Assistant, but it’s also easier on the eyes when readers click on your links for additional reading. Want to stay updated and learn more about the new Google speakable markup? The online marketing and SEO experts at Numero Uno Web Solutions can help you optimize your news web site so that it ranks high on Google’s search engine results page. We can create engaging and high-quality content for your web site so that users will always be interested in learning more about what you have to say. Contact us today to learn more about how we can implement the latest technological advancements to help increase your online presence, traffic to your web site, and overall return on investment.